Medium (The End) takes the form of the projection of a single 35mm slide. The projector is programmed to cause the image to slowly “fade to black” over the duration of the day, based on the gallery opening hours, typically over ten hours. The fade is barely perceptible to the naked eye, and yet from the moment the projector is turned on each morning the “fade to black” begins. By the time the gallery closes at the end of each day the image has completely disappeared. Simultaneously, the prolonged presence of the single slide in the projector gate causes the slow obliteration of the image as the emulsion is affected by the heat and light of the projector bulb. This produces entropy, moving in the opposite direction: a “fading to white”. The slide will be replaced everyday with a fresh copy. 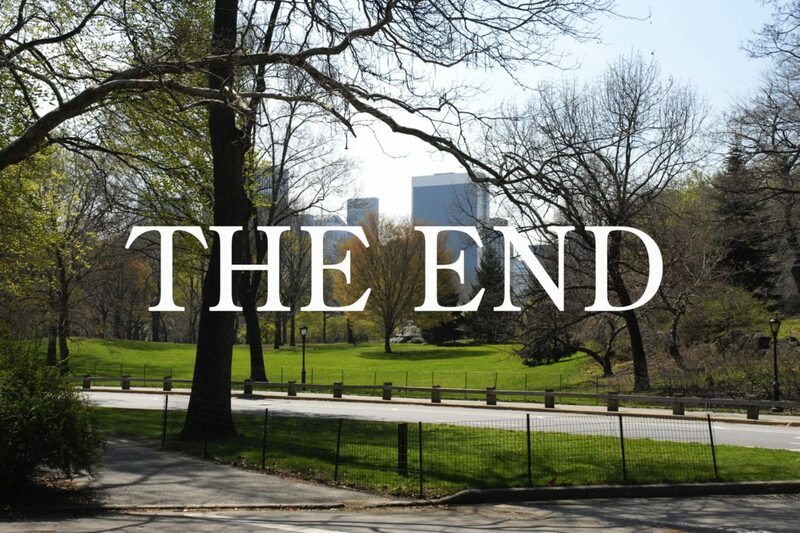 The projected image features a photograph of Central Park, New York taken during spring-time overlaid with text in the manner of a cinematic end credit sequence. Medium (The End) was first exhibited at the Return Gallery at the Goethe-Institut Dublin respectively, from the 8th September until the 6th October 2007 simultaneously with Medium (Upsidedown) at in Gallery for One at 5 Scarlet Row. Curated by Georgina Jackson & Vaari Claffey. The duration of the fade-out in Medium (The End) is based on the length of the gallery day or event in which it is being exhibited. A test version of this work involved a 15 minute fade as part of verbal presentation at the University of Ulster in 2006. A three minute fade made for exhibition To Pay Respect to the Generosity of the Three-Minute Punk-Rock Song at Crate Project Space, Margate, 2011 curated by Toby Huddlestone in a version of the work entitled Medium (The End) TPRTTGOTTMPRS. It was shown again in one day event To Pay Respect to the Generosity of the Three-Minute Punk-Rock Song Pt. 2: re-edit at BEEF (Bristol Experimental and Expanded Film) in 2015.